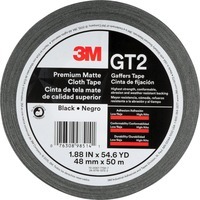 Premium matte cloth tape features a cotton cloth, weather resistant backing with a natural rubber adhesive system for strong performance in high strength and highly conformable applications. Its matte finish creates a professional appearance that may be used indoors and outdoors for numerous applications. Hand tearable material easily rips into narrower strips for quick customization without requiring additional tools. High strength tape is perfect for attaching wires, bundling cables, temporarily holding light fixtures, marking areas where high visibility is required, labeling equipment and more.